Italian Prime Minister Silvio Berlusconi has accepted the rejection of his nuclear power plans and other policies in a popular referendum. With more than 90% opposition to his policies, he said Italians had made their opinion "clear" and government and parliament must "respond fully". The PM had wanted to restart a nuclear programme abandoned in the 1980s. Voters also repealed water privatisation and immunity from trial for government ministers. 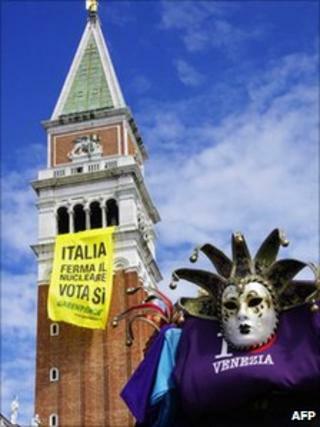 Turnout was about 57%, a significant rise on participation in previous referendums - and a firm rejection of Mr Berlusconi's call for voters to boycott the referendum. Had turnout been less than 50%, the result would have been invalid. More than 94% of voters opposed the government's plans to resume nuclear power generation, while 95% voted to strip Mr Berlusconi of special privileges in legal cases. The high turnout showed "a will on the part of citizens to participate in decisions about our future that cannot be ignored", Mr Berlusconi said in a statement. "The will of Italians is clear on all the subjects of this consultation," he added. "The government and parliament must now respond fully." After a series of referendums over the past 16 years which failed because they did not achieve minimum turnout, the centre-left opposition campaigned hard to get voters to the polling stations. Italy appears to have decisively rejected nuclear power. A number of other policies suffered the same fate, including the plan to allow ministers to stay away from court cases. The referendum outcome is another blow to Prime Minister Silvio Berlusconi. There have been some calls for him to step down, though his coalition partners remain loyal, making his immediate political future safe. Italy now joins Germany in rejecting membership of the nuclear energy club, though both will continue to import it from other countries. Two major European economies are now leaving behind a source of power that both once took for granted. In the shifting dynamics of climate change, safety and alternative electricity sources, others may come to follow. Responding to the result, Pierluigi Bersani, leader of the centre-left Democratic Party, called for the prime minister to resign. It was, he said, "an extraordinary day", which had reinforced the poor performance of Mr Berlusconi's candidates at local elections last month. Anti-nuclear campaigners say Japan's Fukushima disaster in March helped sway public opinion against nuclear power, which Italians rejected in a referendum soon after the 1986 Chernobyl disaster. Italy, like Japan, is prone to earthquakes but the government had said nuclear power was needed to supply about 20% of electricity by 2020. Germany and Switzerland have both recently announced that they will phase out nuclear power in the coming decades, while in other countries, like Britain and France, support remains strong. Italians were also asked two questions on the privatisation of water supplies, and one on whether government ministers could be exempted from court cases. This last question was especially pertinent to Mr Berlusconi, who is currently facing four separate trials. The special immunity granted to him by parliament has recently been struck down in the courts, and Mr Berlusconi has agreed to attend court when not engaged on important business. But he has missed several hearings, and did so again on Monday, meeting Israeli Prime Minister Benjamin Netanyahu instead.